Last night, I kind of freestyled dinner again. I'm declaring it "Freezer February" and in an effort to keep our grocery shopping to a minimum, we are going to try to eat down some of the stuff that's in our freezer. 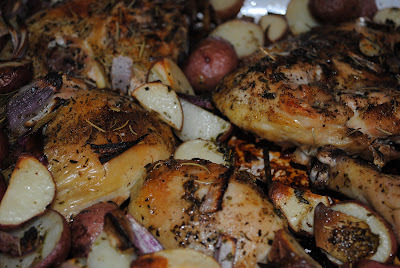 We had a chicken in the freezer, so I cooked that last night, with some sliced up red potatoes and red onion. We had homemade bread on the side, and green bean casserole (I went with the recipe on the French's fried onions can for that). 1 chicken, mine was cut apart, but you could obviously roast it whole! *I googled and read that you should cook chicken to an internal temperature of 180 degrees, but in the end, we were starving and growing impatient and our chicken's internal temperature was only 160 degrees. It was done, and juicy and we are both still happy and healthy! Funny side note: When we first moved into our apartment, I swear our smoke detector could SMELL. Seriously! Every time I would cook anything on the stove or in the oven and it created a scent, not smoke, just a scent! the thing would start beeping. We got maintenance to come out and they installed a newer, less sensitive, but still somewhat easily offended smoke alarm. Occasionally, it will still go off when I'm cooking. The funny thing is, Brokaw is so conditioned... to think that if I turn on the overhead fan.. that the alarm will go off. So, every time I turn on the fan over the stove, he completely freaks out!! 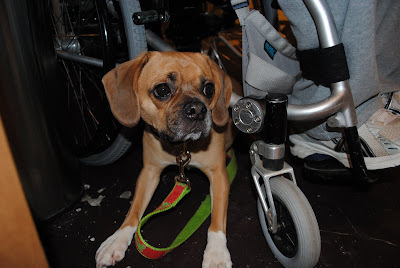 He paces all over the apartment with his tail down between his legs and hides under Michael's wheelchair! Guess that's his "safe spot." This was AMAZING!!! It was super simple and quick to make and my picky family loved it! Will definitely become a staple.